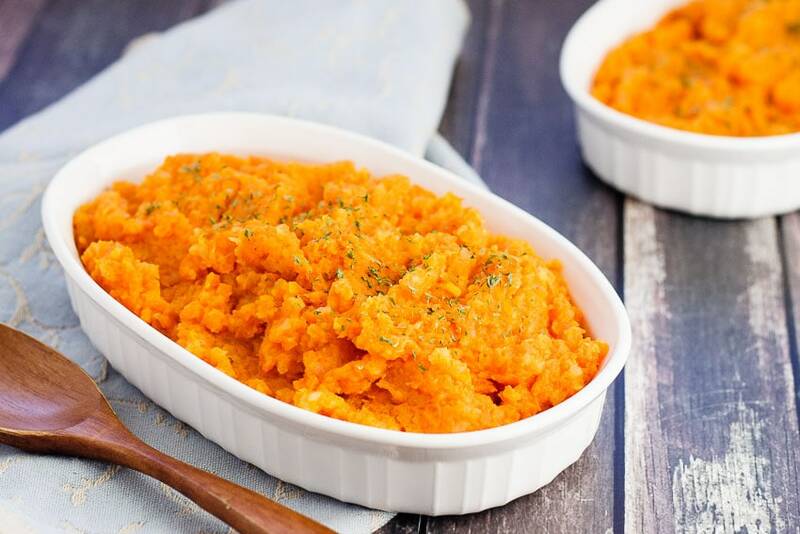 An easy low carb alternative to mashed potatoes for your Thanksgiving dinner, these mashed carrots and turnips are a little bit sweet and oh so tasty! Thanksgiving dinner, or any turkey dinner for that matter, is one of those things that everyone has their traditional side dishes for. Now I’m not one to have a problem with changing things up to try something different – in fact there was almost a revolt one year when I decided to try a different stuffing recipe rather then making the one we have every year. I’m not even joking – I still haven’t heard the end of that. And the new recipe was really good too, although clearly I will never get to have it again. Apparently changing up the traditional dishes at Thanksgiving is akin to sacrilege. Who knew? So this one is traditional. I mean, not for me. I never had this dish at all growing up, had never even heard of mashed carrots and turnips. But for my husband, this dish was always a part of their turkey dinners. Turkey dinner without it just wasn’t the same. The first time I had it with his family, I’ll admit – I wasn’t a fan. It seemed a little weird to mash carrots up. Why? There’s mashed potatoes, why waste space? But I’m getting older now, and liking new things, and I quite enjoyed this when I made it for the first time this year. And the kids ate it too. Even the 4 year old that doesn’t eat vegetables. For some reason, mashing up those veggies makes them a-okay with him. Fine with me. Makes for a happy husband too – I might even make one of his favourite side dishes to go with turkey dinner now! Add to the traditional meal at our house. Because I think it’s okay to change things up. If you are looking for a new side dish to try this Thanksgiving (or Christmas for my fellow Canadians that have already celebrated! ), I would highly recommend this one. Plus, it’s a great alternative to mashed potatoes if you are looking for lower carb options this year. Now what other new side dishes can I add to the menu to shake things up – and maybe have another revolt on my hands?! I’ve also shared this mashed carrots and turnips recipe over on Food Fanatic. OMG THANK YOU!!! My mother in law has been making this every year for Thanksgiving since I met her 30yrs ago but she just puts little of this and that.. I've tried to make it but could never replicate it cuz I wasn't sure exactly how much of each to put in. This came out exactly like I wanted. I am Thrilled to now have this recipe so I can make it for my kids on Thanksgiving! Thank You Thank You Thank You! Thank you for this comment - just made my day! I'm so glad you liked it! Hi Danielle - this was my mother-in-laws recipe so I asked her if she thinks it would freeze well - she hasn't tried, but thought it would likely be quite runny after thawing if you freeze it. Hope that helps! Am I just crazy or does any body else NOT see an actual recipe on this page!? Would love to know how you make it! Hi Sherry - sorry about that - Food Fanatic made some changes to their site recently which messed up my recipe card on those recipes I've shared with them. Thanks for letting me know, it's fixed now and you should be able to see the recipe again. I'd gobble that up as a side dish ANY dinner during fall and winter! Haha, I think that every year as American Thanksgiving comes! Thanksgiving is just the best meal - although I kind of like cooking the turkey - turkey leftovers are the best. :) Thanks Denise! I agree with you! That's the best part about cooking the turkey!! The leftovers, Turkey casseroles, sandwiches and soup. 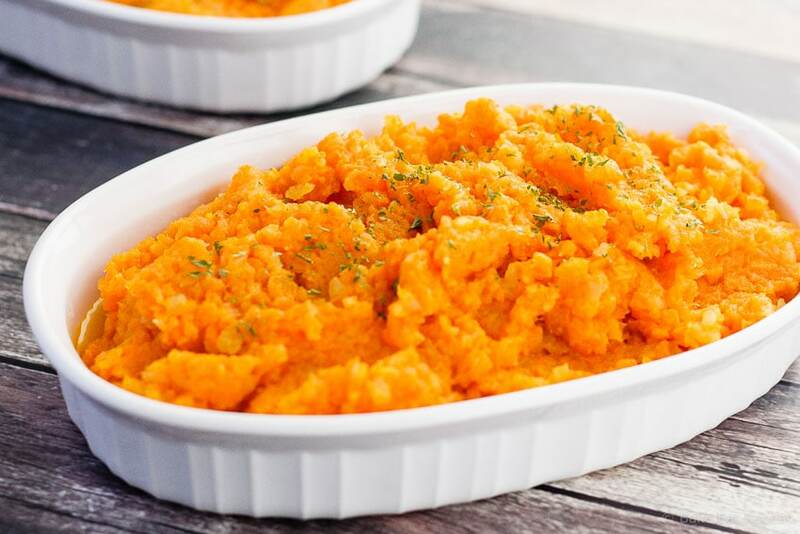 I like the idea of mashed carrots and the turnips are a delicious addition! 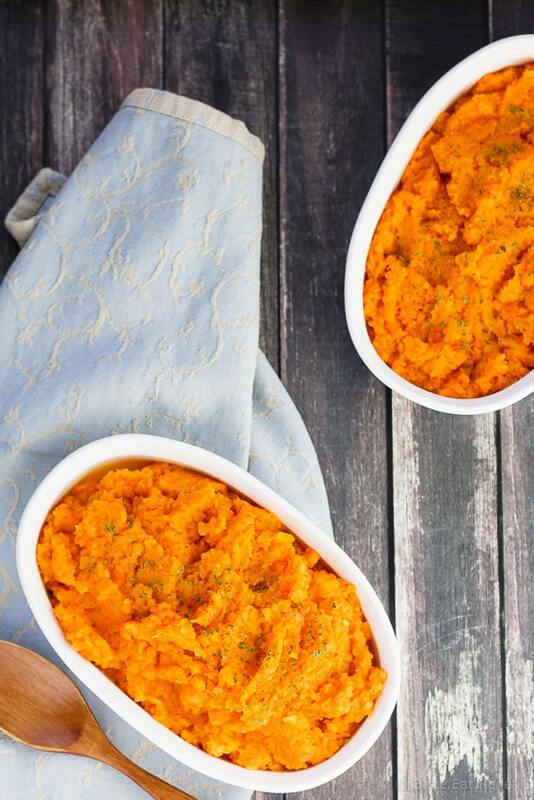 What a great twist on Thanksgiving side dishes! Such a great idea. I need to make this one soon. I love carrots so this is right up my alley! I love carrots but have never thought to mash them up. This has to happen now! We always had turnips as a side dish for our Christmas dinners growing up, so this fits nicely with my family traditions! I love how they're mashed together with carrots here, I'm huge lover of all things mashed! I'll definitely need to try this recipe. Turnips are so underrated. I love the sound of this recipe!